Today is a special day in Turkey. 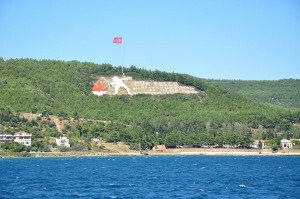 18 March is known in Turkey as Canakkale Victory and Martyr’s Day. It’s an important day, and this year it is the 101st anniversary of Turkey’s defeat of Allied battleships who tried to take control of the Dardanelles, shelling Turkish forts along both the Asian and European shores of the Dardanelles in Canakkale. During this attack, the town of Canakkale, particularly its Greek quarter suffered extensive damage. This day was a critical turning point in the nation building process of the Republic of Turkey and every year we stop to remember the incredible fearlessness and commitment of those soldiers who fought for Turkey’s freedom. 18 March is a solemn day. For Turkish people, it is similar in significance to ANZAC Day, commemorated on 25 April by Australia and New Zealand in memory of the day the ANZAC troops landed at Gallipoli in 1915. 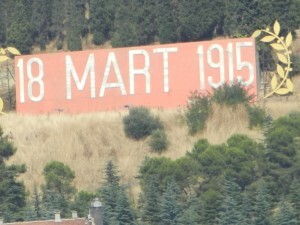 As you catch the ferry across the Dardanelles, from Canakkale to Eceabat, on the Gallipoli peninsula you can see a memorial of the events of 18 March 1915 – a large red sign with the simple words: 18 Mart 1915. For most Turkish people, just hearing these few lines are enough to invoke the sentiment of the full poem, which honours the 86,000 soldiers who gave their lives and the 164,000 who were wounded, defending Turkish shores in the Galllipoli Campaign. And so today, on the 18 March, we stop, and we remember, with the deepest respect, the courage shown by these men back in 1915, and their sacrifice for Turkey as a nation.